Dr. Nitin leekha is a Senior Oncosurgeon who has been trained at the leading most cancer centers in India and abroad. He is a MCI (Medical council of India) certified Oncosurgeon who has done MCh(Oncosurgery) from the prestigious Regional cancer centre, Thrivanthapuram. He has experience of working and training in the leading cancer institutes of India, including TATA Memorial hospital Mumbai and AIIMS, Delhi. 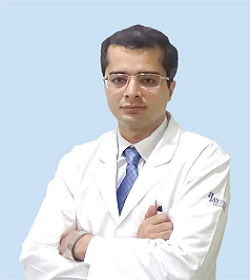 Prior to being trained in Surgical Oncology, Dr Nitin Leekha was in Maulana Azad Medical College and Lok Nayak Hospital from where he completed his Post Graduation (MS General surgery) and did his Senior Residency. He has also done various fellowships from India and abroad. He has undergone advance training in uniportal thoracic oncosurgery from The First Affiliated Hospital of Guangzhou Medical University, China and Prince of Wales Hospital, Hongkong. He has also undergone training in various others aspects of oncology like HIPEC (Hyperthermic Intraperitoneal Chemotherapy) , Robotic surgery and Minimal access oncology. Prior to joining Jaypee hospital Dr Nitin Leekha has worked at Senior positions in Max hospital and Pushpanjali hospital. Dr. Nitin Leekha is expert in performing a wide range of complex Oncological surgical procedures including advanced Laparoscopic procedures and management of difficult cases. He strictly believes in multimodality approach. He is one of the pioneers of Uniportal Thoracic surgery in India. Various thoracic surgeries including Pneumonectomis, Lobectomy, Segmentectomwx y , Thymectomy, Bullectomy, Decortications, Guided biopsies etc are being performed through uniportal VATS (Video assisted Thoracoscopic surgery). He routinely performs advance Laparoscopic procedure including Minimally Invasive Esophagectomies, Laparoscopic Gastrectomies, Laparoscopic Whipples, Laparoscopic Colectomies, Laparoscopic and Laparoscopic Anterior resections and APR. Dr Nitin Leekha is also doing Gynaecological and Genitourinary oncology, notably Laparoscopic Radical hysterectomies, with Pelvic and Para aortic lymph node dissections, Laparoscopic Radical Nepherectomis and Radical cystectomy with Neobladder/ Ileal conduit. Specialized world class surgeries for breast cancer including all types of Oncoplastic Breast cancer surgeries, Breast conservation, Radical Mastectomy and Reconstructions are being done for last many years. In Head and neck oncology all surgeries including wide excision, Neck dissections, Commando surgery with reconstruction including Free Flap is done. All kinds of laryngeal and pharyngeal resection with reconstructions are also done. Dr Nitin Leekha is also one of the few surgeons doing transaxillary endoscopic parathyroid and Thyroid resections.